So i was wondering has Natasha ever interacted with the Rasputin siblings (other than avx)? There’s one major story about this, but it’s in Claremont’s fanfic of his own comics known as X-Men Forever. Pitched as a continuation of his classic run from where he left off, ignoring everything that’s happened since, it features Storm who is evil and also a teenage clone for some reason, and ships like Jean/Beast. There is also a “Russia” arc about the Rasputin siblings that heavily features Natasha. 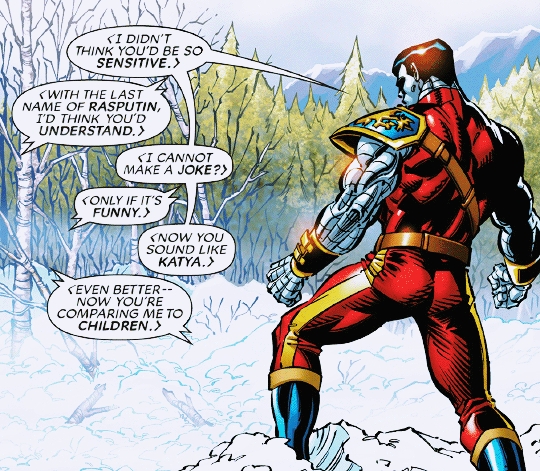 Claremont being Claremont, he uses the opportunity to make Romanov/Rasputin jokes. Piotr: I’m down, Tzarina. No contact yet. Everything’s quiet. Natasha: Will you stop calling me that? Piotr: I didn’t think you’d be so sensitive. Natasha: With the last name of Rasputin, I’d think you’d understand. Piotr:I cannot make a joke? Natasha: Only if it’s funny. Anyway, in this continuity, both Piotr and Natasha have left their respective super-teams to work for the Winter Guard, near where Piotr grew up. They worked together for a long time, fell in love, and by the time we meet up with them they’re in a very committed relationship. It’s hard to get a sense of their dynamic because the build up happens entirely off-screen. All they talk about re: each other is how much they’re in love, and the explanation we get that it just kind of happened. 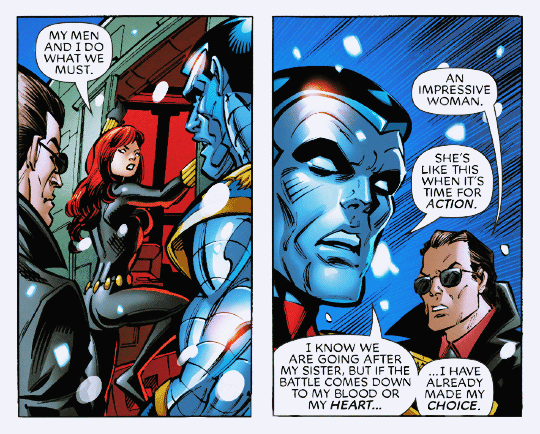 The story is told from the point of view of Kitty Pryde, so it’s more about tying off her romance with Colossus, and them both moving on, than it is about how Piotr and Natasha fit together. Natasha is presented as a foil to Kitty: whereas she’s much younger than Piotr, Natasha is much older, experienced and worldly-wise. But Claremont also plays with their similarities. They’re both determined, heroic women. Moreover, Natasha winds up playing surrogate Wolverine for Kitty, just as Kitty is coping with Logan’s death. (She’s also… inherited a single claw from Wolverine? Idk.) There’s a neat moment where Natasha kills the bad guy so that Kitty doesn’t have to, reflecting the parallel connections they share with Logan, and the different paths they’ve taken on their own. But anyway, about Piotr. The only things you get from their panels is together are that they are super googly-eyed for each other and that Natasha is definitely the boss. Natasha: My men and I do what we must. Piotr: She’s like this when it’s time for action. I know we are going after my sister, but if the battle comes down to my blood or my heart… I have already made my choice. Illyana features too, but she’s still de-aged at the start of this story. Natasha cares about her in the context of her relationship with Piotr, but by the time we actually see all of them on a panel together, Illyana has been turned evil with magic. At the end of the story, she’s still evil and teleports away while cackling. So, uh. ??? Other than this and AvX, I can’t remember them interacting. Panels from X-Men Forever #11 & 14. Posted on August 13, 2015 Tags black widow, colossus, magik, questionsLeave a comment on So i was wondering has Natasha ever interacted with the Rasputin siblings (other than avx)? 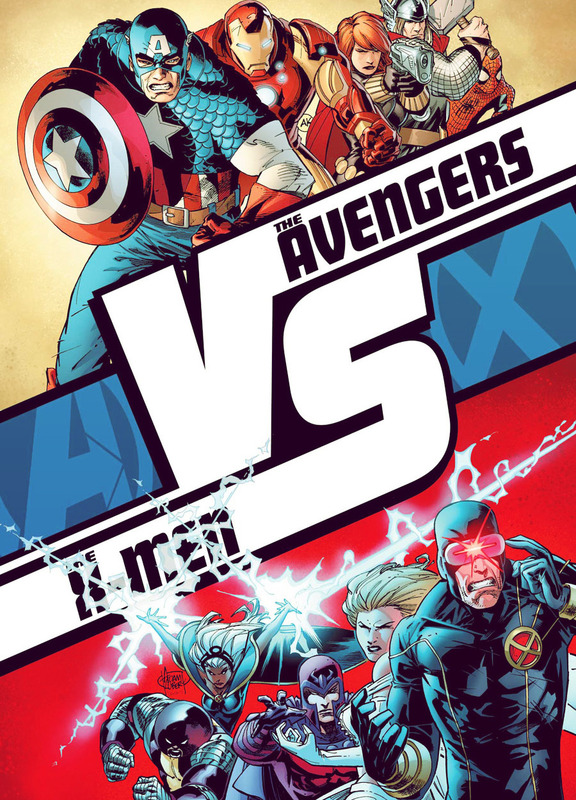 Marvel just announced a tie-in to their yearly event— this one’s called Versus. 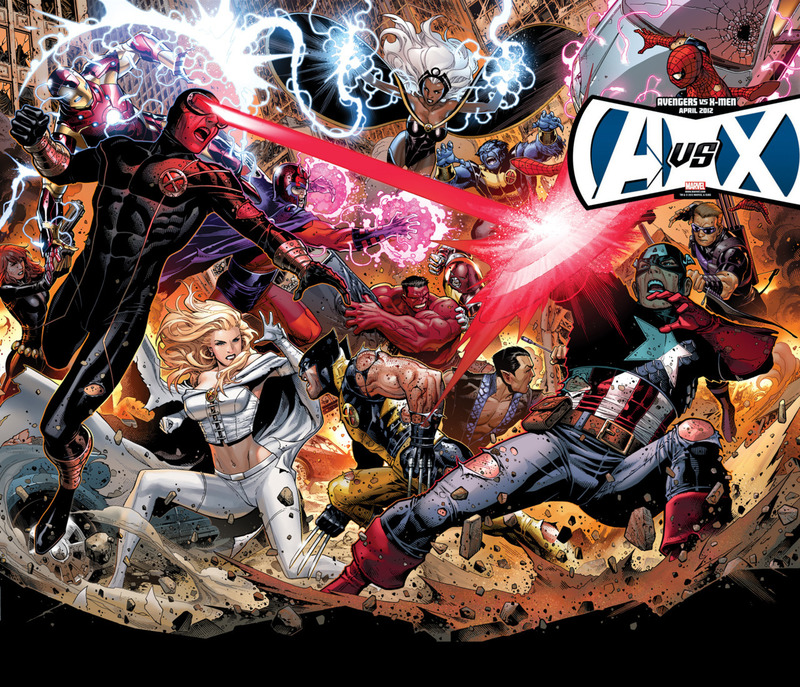 The editors described “AvX: Versus” as the “anti-‘Front Line.’” “We just wanted more fights,” said Lowe. The first issue will contain a Magneto vs Iron Man fight by Adam Kubert and Jason Aaron, and a Namor vs Thing fight by Kathryn and Stuart Immonen. Since Natasha’s on this cover, it seems mildly likely she’ll show up at some point, but I don’t think they’ll ever be able to top her showing in Contest of Champions II, where she single-handedly took out both Wonder Man and all of X-force. Thanks, Chris Claremont! And here’s the highest quality version of that Jim Cheung spread I could find.